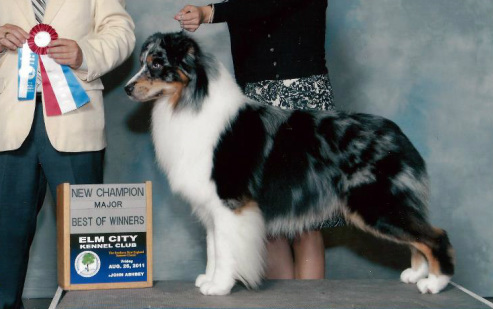 Pilot is AKC Champion and a group placer. He is OFA excellent, Elbows Normal and eyes cleared yearly. He has been cleared for hereditary cataracts. He is also MDR1 Normal/Normal. Dutch is the pick of the litter out of our very own Pilot and Twister and he has it all. Lovely movement, colors, temperament and personality. We are excited about this boy growing here and entering the show ring. Toto is out of Twister and Pilot repeat breeding.